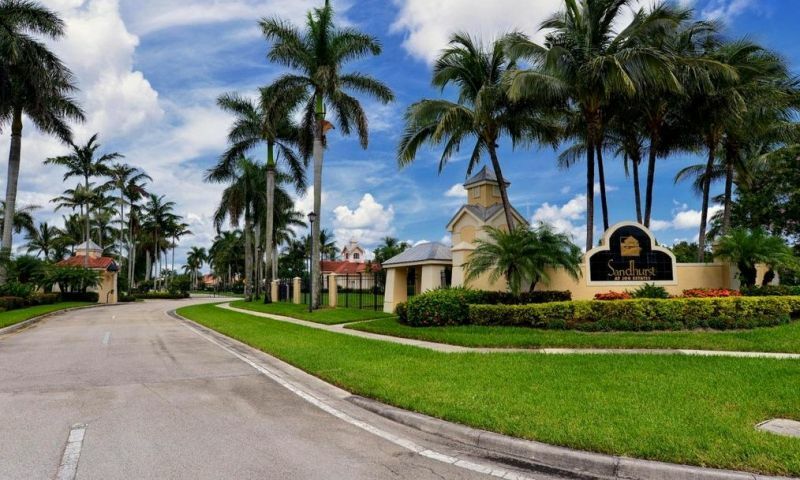 Sandhurst at Jog Estates is a 55+ community located in beautiful Boynton Beach, Florida. Active adults can enjoy a quiet neighborhood setting that consists of a clubhouse, outdoor pool and 104 single-family homes. This charming active adult community offers homes on a resale-only basis with an established homeowners' association (HOA) allowing residents to enjoy a maintenance-free lifestyle. Ideally located north of Woolbright Road and west of Jog Road, residents have easy access to major highways, beaches, shopping, and attractions. Sandhurst at Jog Estates provides a great location as well as a low-maintenance lifestyle to active adults. The central hub of physical and social activity is at the community s clubhouse. The clubhouse features an exercise room where residents can stay in shape using the cardiovascular and weight-training equipment. A multi-purpose room is also a convenient place where neighbors gather for a card game or casual conversation. The outdoor amenities include a swimming pool and spa that s perfect for rest and relaxation. Active adults can continue their physical activity at the tennis court or enjoy a leisurely stroll along the walking trails that surround the community. Homeowners can also enjoy the scenic views of the lakes around Sandhurst at Jog Estates. The 104 single-family homes in Sandhurst at Jog Estates were built from 1999 to 2002. These resale homes are situated around a scenic lake, cul-de-sacs, and lush tropical foliage. Residents can choose from a single-story or two-story home that features a spacious covered patio or front porch. Homebuyers can purchase a beautiful resale home in Sandhurst at Jog Estates. These single-family homes offer approximately 1,800 to just over 3,700 square feet of living space with two to four bedrooms and bathrooms, and an attached two or three-car garage. Interior home designs feature tile floors, granite counter tops, custom cabinetry, walk-in closets, dual vanities, large showers, and spacious master bedrooms. Residents in Sandhurst at Jog Estates enjoy a maintenance-free lifestyle thanks to the homeowners association. The HOA fee includes gated security, landscaping of common areas and yards, alarm systems, basic cable, and clubhouse upkeep. Active adults have more time to pursue their own hobbies or other fun activities because they aren't busy with mowing their lawn. Residents have more time to hang out at the clubhouse, play tennis or cards with neighbors, and enjoy a relaxing swim in the pool. Sandhurst at Jog Estates is located in sunny Boynton Beach, Florida. Homeowners have easy access to major highways like the Florida Turnpike and Interstate 95 as well as plenty of shopping, dining, and entertainment attractions. This 55+ community's convenient location also allows residents to visit a few golf courses such as Westchester Country Club and Indian Spring Golf Club. Boynton Beach also offers many scenic beaches along the Gulf Stream for fun sand and water activities. Residents will also enjoy having the Palm Beach International Airport less than 30 minutes away or Fort Lauderdale International Airport that's 45 minutes away. Sandhurst at Jog Estates is a quiet 55+ community with well-crafted homes that's perfect for active adults in Palm Beach County. There are plenty of activities available in Sandhurst at Jog Estates. Here is a sample of some of the clubs, activities and classes offered here. Homebuyers can purchase a resale home in Sandhurst at Jog Estates. These single-family homes offer approximately 1,800 to just over 3,700 square feet of living space with two to four bedrooms, two to four bathrooms, and an attached two or three-car garage. Interior designs feature tile floors, granite counter tops, custom cabinetry, walk-in closets, and spacious master suites. They also have covered patios or front porches, which are great spaces for relaxing or entertaining guests. Please Note: Floor plans are not available at this time. 55places.com is not affiliated with the developer(s) or homeowners association of Sandhurst at Jog Estates. The information you submit is distributed to a 55places.com Partner Agent, who is a licensed real estate agent. The information regarding Sandhurst at Jog Estates has not been verified or approved by the developer or homeowners association. Please verify all information prior to purchasing. 55places.com is not responsible for any errors regarding the information displayed on this website.